Fall is here, which means that Halloween is right around the corner! One of the best things about Halloween is the family tradition of going trick-or-treating. 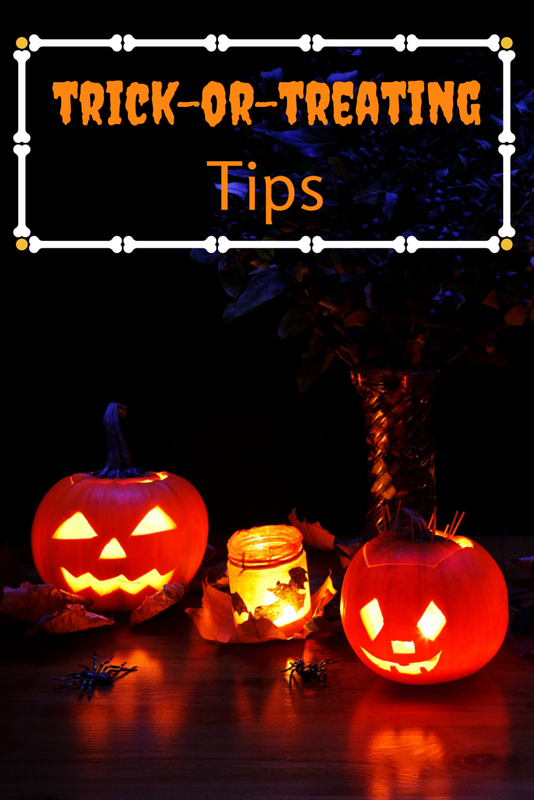 If you take your family trick-or-treating each here, here are a few tips you’ll want to know. Most neighborhoods and cities schedule their trick-or-treating hours for dusk. Because of this, it can be hard for drivers to see all of trick-or-treaters walking around. To help keep you and your family safe this Halloween, make sure you’re visible to drivers. You can do this by carrying around a flashlight or by adding reflective tape to everyone’s costumes. It can be tempting to consume every piece of your Halloween loot, but this might not be the best thing. After your night of trick-or-treating, go through your children’s bags and make sure all of the candy is still factory sealed. Never let your kids eat homemade treats since you don’t know what’s been added to them or how sanitary the cook’s kitchen is. You probably don’t think about this when buying costumes for your kids, but fitted costumes are important for your child’s safety. Huge costumes that drag on the ground can be a tripping hazard for your kid. This can cause your child to fall and scrape a knee or even fall in front of a car. In addition to wearing fitted costumes, you might want to skip the masks. Masks are notorious for slipping and covering your kids’ eyes, especially if the mask is a little bigger. This can obscure your children’s vision, which is very unsafe when walking on sidewalks and across streets. Here’s a tip that can help you get the most Halloween loot! You can guarantee tons of candy and safe trick-or-treating by planning your route. You can plan your route in your own neighborhood or you can visit a different neighborhood. Ask your friends and family to find the best and safest place to go trick-or-treating and plan your night according to their advice. Trick-or-treating is one of the most fun things about Halloween. Kids and adults alike look forward to dressing up as a favorite character and getting free candy out of the deal. Although trick-or-treating is a lot of fun, you need to be focused on having a safe time as well. These tips are designed to help keep you and your kids safe while you trick-or-treat. What are some of your best tips for Halloween night? I remember getting tips as a kid on people putting razor blades in candy! So sick! So yes, sealed candy is a must. And going where it's well-lit and with a group of friends or with your family if you're not a teen. Yes, I totally trick-or-treated as a teen. Don't tell anyone. We always bring a flashlight and I put glow sticks on the boys so I can tell them apart from other kids if we end up in a crowd. Great tips. We always have the kids stick together and here in NY we usually go to the corner stores and get our candy. We don't go door to door. Sealed candy is important and Madison, be sure to let your Mom or Dad check all the candy before you eat any of it. These are great tips for new parents. It always seems like a great idea in your home but once you are out there in the dark, walking down the street it looks totally different. I would add bring a flashlight but this a terrific list. These are great tip. Safety is always first on my mind! Just pinned your great tips! I make my kids wear tennis shoes no matter what. It keeps their feet more comfy for the walking. This year we have glow sticks and glow rings and we will all be wearing comfy shoes. We always stick to the same route with most of the rest of our town. For me I always make sure son wears something that glows so he can be seen. Whether that's a glow stick, hat or shoes. Staying visible on Halloween is so important! You don't want to have a reckless driver or anything ruin your night. Thanks for all the tips. You cannot be to safe when it comes to kids. MAsks can be too humid here in Florida so we try to avoid them. Great tips! Great tips! We are looking forward to the hundreds of trick-or-treaters that come through our neighborhood! So fun! These are some great tips for trick-or-treating this Halloween. Thanks for sharing. I always made sure the kids had reflective spots on there costume. I try to make sure my porch is well lit so no one trips. Planning the route is someting we need to be better at. We always walk too far out of the way and end up with over tired kiddos. Good tips for Halloween safety. I'm not crazy about my kids wearing masks either but unfortunately most super hero costumes come with them and my son insists on wearing them. My kids are grown so I don't am kind of out of the whole active trick or treating as far as going out for candy but we still hand candy out. One thing hat always bugs me is the number of adults that bring a bag and say they are collecting candy for a sick child. I don't tend to believe them, LOL. Great tips. It can be so easy to get separated and lost when involved with a large group of treaters in town or in business places. These tips are very informative and important. Safety is something I always worry about on Halloween. I really didn't think about wearing a fitted costume. You're 100% right though, those that drag or have pieces that could get caught on things are not the best idea at all for safety. Perfect. We never celebrate halloweens here - but I wish we do.. :) It would be much fun and exciting for sure.